A Babylonian amora, senior contemporary of Abaye and Raba (B. ḳ. 40a), and a disciple of Huna, head of the academy at Sura. So incessant was his application to study that it undermined his health, and brought on a serious illness, from which, however, he recovered. Seeing some of his former schoolmates, who had contracted similar ailments and had become chronic sufferers, he applied to himself the Scriptural saying (Eccl. vii. 12), "Wisdom giveth life to them that have it" (Yeb. 64b). Nor did he long remember the warning of his early experience. He devoted all his days to the study of the Law; and when worldly avocations compelled him to "borrow" part of the day, he would "repay" it by studying at night ('Er. 65a). After his ordination as teacher he established himself at Paphunia (Epiphania; supposed to be on the Euphrates), where he became an authority on ritual matters, as well as a distinguished haggadist. By degrees he earned the reputation of being one of the foremost men of his age ('Er. 63a). He is also reported to have been a skilful writer of Torah scrolls (B. B. 14a; ḳid. 35a; B. ḳ. 54b; Niddah, 67b; Sanh. 46b). Fragments of his homiletic sayings are preserved in Shab. 85a; 'Er. 54a; Pes. 3a; Yoma, 19b, 75b; Ḥag. 13a; ḳid. 40a. In halakic discussion he is quoted in Yer. Sheb. vi. 36b; Pes. 116b, 117b; Yoma, 76a; ḳid. 35a; Sanh. 36b; Hor. 5b, 6b; Ker. 5b. In addition to his diligent pursuit of halakic and haggadic studies Aḥa appears to have applied himself to philosophy and mysticism (Ber. 59a, Shab. 66b, B. B. 75a), and legend represents him as an adept in the occult sciences. It relates that a demon had established himself in the neighborhood of Abaye's academy, and greatly harassed the frequenters of the school, even when they walked together in day-light. No one seemed able to dislodge him. 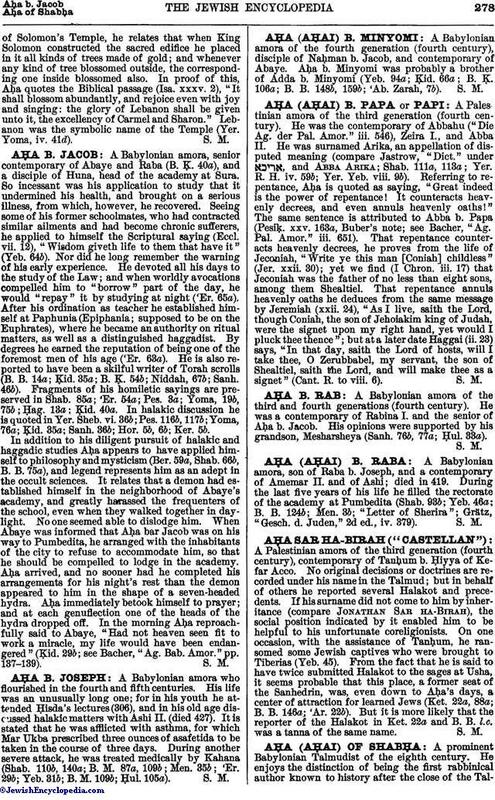 When Abaye was informed that Aḥa bar Jacob was on his way to Pumbedita, he arranged with the inhabitants of the city to refuse to accommodate him, so that he should be compelled to lodge in the academy. Aḥa arrived, and no sooner had he completed his arrangements for his night's rest than the demon appeared to him in the shape of a seven-headed hydra. Aḥa immediately betook himself to prayer; and at each genuflection one of the heads of the hydra dropped off. In the morning Aḥa reproachfully said to Abaye, "Had not heaven seen fit to work a miracle, my life would have been endangered" (ḳid. 29b; see Bacher, "Ag. Bab. Amor." pp. 137-139).